If Casino Cruise has one thing, it’s standards. It screams of exclusivity and the champagne fuelled life of luxury that so many of us dream of. They live up to their name too, because as well as creating their own fictional world on board an imaginary luxury cruise ship, players could potentially win various holidays on real cruise ships if they meet certain requirements. It’s an original USP to say the least, and the sense of escapism appeals to many. Founded by casino enthusiasts for casino enthusiasts and owned by Genesis Global Ltd, Casino Cruise only weighed anchor back in 2014, but quickly began making waves. There are more than 1300 games in total for a start, from a choice selection of top developers. They steer the ship clear of anything that might not be considered highbrow (sorry Bingo lovers), but if Slots and Table Games are your thing you will be drowning in choice. Too many nautical references? Sorry. This instant play casino is all about style and class, so it needs a website to match. It’s got one. The imagery is clean cut, well-proportioned and aspirational, and the site effortlessly glides from one page to the next. Although it doesn’t take long to get used to the mechanics, at first glance it isn’t immediately obvious where to start; they have certainly put a lot of effort into it but we wouldn’t call the result intuitive. The colour palette is dazzling, but functionally the site can be a little laborious in places. Don’t get us wrong, it’s quality, but in a bizarre twist of fate the company’s main strength is also one of its weaknesses. The baffling number of titles coupled with the large game tiles makes browsing with the current set up a bit of a nightmare. It’s alright if you know what you are looking for (there’s a search bar), and you can categorise games to thin the herd, but even then, it takes endless scrolling and clicking of ‘more games’ to get through them all. We won’t do the maths but scrolling through 1300 games 12 at a time is no-one’s idea of fun. It left us wondering if it is actually possible to take full advantage of the staggering range of games on offer. Thank goodness for the little button that whips you to the top of the list you’ve just scrolled through. 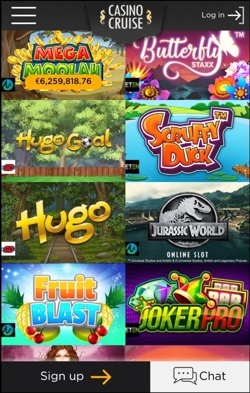 When it comes to the developers, Casino Cruise keep it a high-end experience by only working in conjunction with the cream of the crop, namely, NetEnt, Microgaming, NYX, Evolution, Play ‘N Go and Quickspin; and they aren’t accepting any left overs either. The titles on offer are fit for the Captain’s table, and most are available to demo before you spend your hard earned cash on them, which always seems fair. Slots – Numbers are meaningless at this point, but safe to say it’s 600+. Among the almost intimidating selection of slots are Gonzo’s Quest, Jurassic World and Crystal Queen. Classic Slots – Take it old school with 40 classic slots including Gift Shop, Jingle Bells and Jester Jackpot. Roulette – Roulette dominates a category all of its own at Casino Cruise and comes in 36 different varieties; Rocket, English, Turkish, Lightening, Double Ball – the list goes on. Live Casino – Casino Cruise work hand in hand with Evolution Gaming, and the live casino is packed to the brim, with Dragonara Roulette and Dragon Tiger meeting the needs of Dragon fans everywhere. Jackpots – Not only are there 29 different jackpot games to choose from, but some of them are worth multi millions of pounds. Mega Moolah and Arabian Nights are a couple of 7 figure favourites. Table Games – Putting aside the 18 Roulette games that are confusingly mixed in here, there are 55 table games on show, with about half being variations on Blackjack and the rest made up of Poker, Baccarat and a game called Beat Me, which sounds like a challenge us. Scratch Cards – There are only 5, we don’t know why they have bothered to be honest, but never the less if you want a quick break from the slots you could try Beerfest or Slam Funk. Launching the mobile site at almost the same time as the desktop site was an unusual move, but one that showed the casino were ready to go full steam ahead right out of the box. More than 500 games are currently available on mobile, which isn’t their whole catalogue, but it matches up to some of the industry giants. There is also an app which is much the same, and both work smoothly without compromising the first class feel that the website gives off, and both have been optimised for speed. The app is only available from the App store (bad luck Android users), but the mobile site is just as good. They are laid out in a uniform fashion, which means you will instinctively know how to find what you are looking for, and all the search functions are still there, as well as the live chat button should you need it. Opening in 2014 with licenses from the UK and Malta, Casino Cruise portrayed an image of professionalism from the start. Operated by Genesis Global Ltd and using a software platform provided by the award winning EveryMatrix (which is what gives them access to such a huge range of games), they sent out a clear signal that they were the genuine article. The people behind Casino Cruise style themselves as a forward thinking bunch who “smash through barriers”, and their enthusiasm has enabled them to grow their offering at an alarming rate, winning an award for their affiliate program at just one year old. Ok, you don’t quite get the same around the clock support that you can get elsewhere – the live chat isn’t 24 hours for example – but this is a minor grievance, and one which they told us they were working on improving. Even if you were struggling at 3am there is a comprehensive FAQ section that is nicely broken up into manageable sections. Aside from that there is a freephone support line you can call between 8am and midnight, and they tend to respond to e-mails in a timely fashion. The few complaints that have been made seem to have been settled satisfactorily so all in all Casino Cruise scrubs up well. Live Chat – Help is never far away since the live chat button stays tucked in the corner of all pages (unless it’s between the hours of 12pm – 8am, when it’s shut). 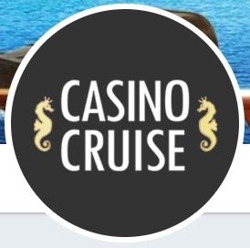 @CasinoCruise1 – More for promotions and offers really but worth a follow.